Let the light of the moon and the twinkling city lights guide you through the sparkling waters of Sydney Harbour aboard the flagship MV Sydney 2000. Indulge in an a la carte menu served on upper decks affording pretty views of Darling Harbour and party well into the night with the live band. Offering a supreme range of service and quality, the Gold Penfolds Dinner Cruise provides an exclusive and luxurious experience of Sydney Harbour by night. Priority boarding and the exclusive Captain's Cocktail Welcome Reception sets the tone for a night of white glove service, 6 course degustation and Penfolds wine. Step aboard the cruising restaurant of the prestigious MV Sydney 2000 and enjoy the finery of sweet and savoury treats accompanied by tea and coffee and amazing views of Sydney Harbour. Cruise past the lifestyle mansions offering million dollar views and enjoy a unique perspective on the city skyline. The perfect way to combine indulging in a delicious buffet lunch and exploring the stunning sights of Sydney Harbour, this lunch cruise by Magistic Cruises offers air conditioned comfort and outer decks boasting uninterrupted views of the Opera House, Harbour Bridge, Fort Denison, Luna Park and 'millionaires row'. Experience the elegance of a la carte dining and international cabaret acts aboard a stylish vessel bound for the dazzling waters of Sydney Harbour. 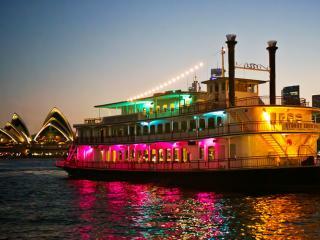 A unique way to see some of the harbour's main attractions, this dinner cruise offers an unforgettable extravaganza of dancers, showgirls, performers and colourful costumes. One of the most beautiful ways to experience picturesque Sydney Harbour is bathed in the glow of the setting sun with this dinner cruise. Board the MV Sydney 2000 and soak in the relaxed atmosphere of this prestigious vessel as the sun sinks below the horizon of the harbour. 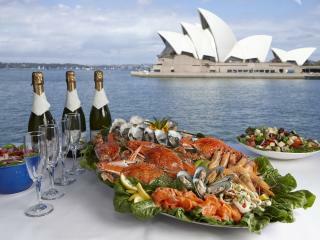 A two course meal is served as you enjoy spectacular views of Sydney Harbour and take in the sights. The cruise returns in the early evening, allowing you plenty of time for other attractions such as one of Sydney's premier theatres. 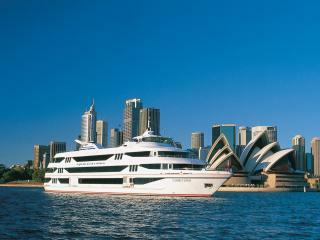 Enjoy a luxury lunch cruise aboard the deluxe MV Sydney 2000 boasting a seafood buffet, cocktail bar, entertainment facilities, dance floor and three separate dining decks. Featuring stunning views of Sydney Harbour, the cruise travels through Circular Quay, Rose Bay, the lower North Shore and the Eastern Suburbs. 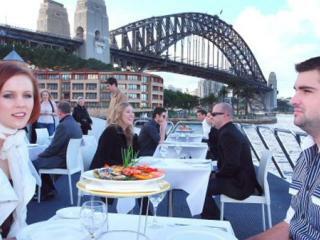 The ideal way to satisfy your cravings for sumptuous cuisine and spectacular views of Sydney Harbour, this delightful lunch time cruise in a wonderful way to relax and discover the beauty of the harbour bathed in the gorgeous midday sun, providing the perfect weather and backdrop for enjoying the outdoors.